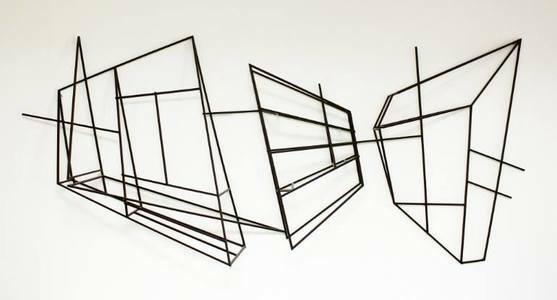 www.jeroenmolenaar.com Molenaar's work is characterized by suggestions of space and perspective. Everything is relative. Skew is the basic element in his work, and is used to create the illusion of depth. He knows how to effectuate this confusion both in his objects as in his paintings. Both his sculptures and paintings show a composition of lines and structures in which he responds to the urban and rural environment, which he abstracts and deforms. With simple materials and techniques - wooden slats, paint and canvas - he realizes a maximum spatial effect: depth, perspective, layering and deformation. ArtEZ-CABK Institute of the Arts, Kampen, NL. Artoverijssel Proof, HeArtGallery, Hengelo, NL. Rhizome - BHW 2.0 Cityscapes Gallery, Amsterdam, NL. 10-1-2017 / 11-02-2017. PHK18:schaal, PHK18, Rotterdam, NL. 16-08-2016 / 01-2017. Nylonfabrik, St Niklaas, BE. 10-11-2016 / 20-11-2016. Circular City Salon, Cityscapes Gallery, Amsterdam, NL. 27-08-2016 / 29-08-2016. Blauwdruck de galerie, Zwolle, NL 30-06-2016 / 30-09-2016. PHK18, Rotterdam, NL. 22-05-2016 / 18-10-2016. Galerie Joghem / Sanquin, Amsterdam, NL. 24-06-2016 / 20-08-2016. Artoverijssel, Museum Het Palthe-Huis, Oldenzaal, NL. 12-03-2016 / 17-04-2016. Broedplaats Estafette, Galerie Het Langhuis, Zwolle, NL. 14-02-2016 / 03-04-2016. 'Summer in the city 2, Oh brave new world..', Cityscapes Gallery, Amsterdam, NL. Exhibition @ Boterdiep 63, Groningen, NL. Global Village, Stichting White Cube. 08-08-2014 / 14-09-2014, Brondby Strand, Denmark. 'Zomerexpo Licht', Gemeentemuseum Den Haag, The Hague, The Netherlands.